The ALPS Map is back in print in 2019 1/500 000th! Browse through the Alps with AIRMILLION Alps map 2019 e xplore new horizons with the range of Europe MILLION AIR cards! Alps map has the scale of 1: 500,000, the entirety of Switzerland and Austria, most of Slovenia, el northern Italy, southern Germany and of course the French Alps. 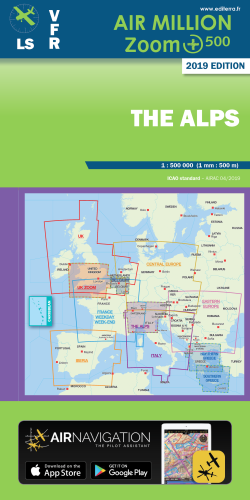 The card contains all the information necessary to AIP flight: airspace SFC to FL180, controlled areas and restricted areas, airfields, radio means etc.